This game is based on the ancient Chinese game of Choi Dai Di (Known as 'Big Two' in English, similar to Pusoy Dos in the Philippines). This special deck, however, has 60 cards, instead of the standard 52, which changes (for the better) the odds of the game and increases the strategy involved. Another difference from the classic game, is that the publishers have added a game board for keeping score, adding even more strategy, because players have choices on how to move their pawns. 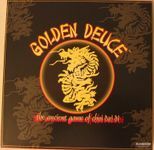 The game starts with a round of the Golden Deuce card game - lay down higher tricks than the other players for control of the lead. Be the first player to lay down all the cards in your hand, and you gain points for all the cards left in the other players' hands. Moving to the game board, each player strategically moves any of their pawns the number of spaces to match the points earned in the card game round. Players can choose to move all of their pawns around the board at once (and therefore be able to block out opponents) or move one at a time (and capitalize on the amount of spaces moved). Once all players have moved, another card game round starts, and the game ends when one player has moved all of their pawns to the finish.